South Golden Beach is a sleepy little beachside village situated approx 10 minutes north of Brunswick Heads and 20 minutes north of famous Byron Bay. This area is a popular seaside getaway for the weekend or family holiday particularly as it is only a 90 minute drive south from Brisbane. Their is also a dog friendly beach for your family pet. 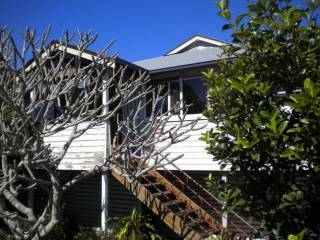 The property is fully fenced and located on Pacific Esplanade in peaceful South Golden Beach. The main house consists of 2 bedrooms plus a laundry, toilet, bathroom, kitchen and lounge room opening onto the front verandah. The bunk house is a detached converted garage with a shower and toilet. The property also has an outdoor hot water shower. The house is fully equipped for children with a port a cot, high chair, toys and games. Enjoy lazing on the quiet, white sands of South Golden Beach or pack your surf board and fishing rod. Immediately in front of the property is a dog free area or 50 meters north the beach is dog friendly. Less than 5 minutes away is the Ocean Shores Country Club boasting one of NSW\'s best golf courses.